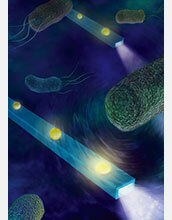 An artist�s illustration of nano optical fibers detecting femtonewton-scale forces produced by swimming bacteria. 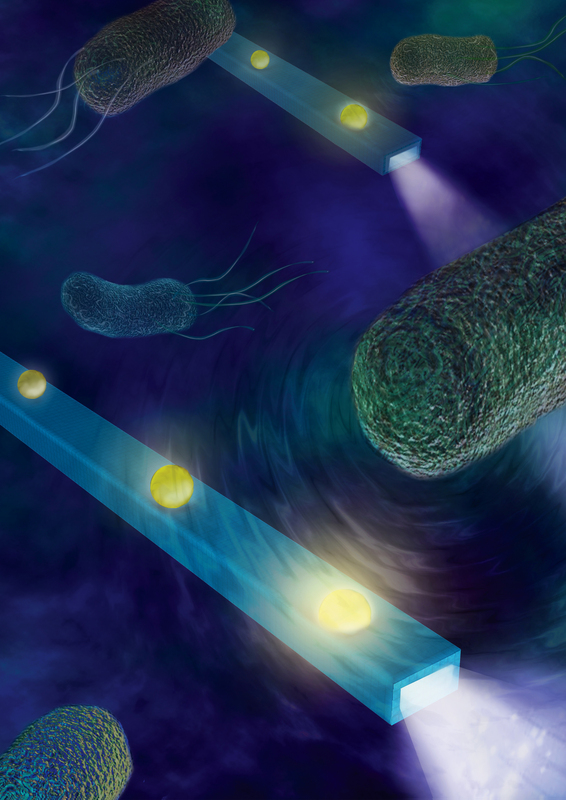 Engineers at the University of California, San Diego (UC San Diego), have developed a miniature device that�s sensitive enough to feel the forces generated by swimming bacteria and hear the beating of heart muscle cells. The device, a nano-sized optical fiber about 100 times thinner than a human hair, can detect forces down to 160 femtonewtons -- about 10 trillion times smaller than a newton -- when placed in a solution containing live Helicobacter pylori bacteria (swimming bacteria found in the gut). In cultures of beating heart muscle cells from mice, the nano fiber can detect sounds down to -30 decibels, a level that�s 1,000 times below the limit of the human ear. "This work could open up new doors to track small interactions and changes that couldn�t be tracked before," said Donald Sirbuly, a nanoengineering professor at the UC San Diego Jacobs School of Engineering, who led the study. Sirbuly envisions possible applications for the device include detecting the presence and activity of a single bacterium; monitoring bonds forming and breaking; sensing changes in a cell�s mechanical behavior that might signal it becoming cancerous or being attacked by a virus; or a mini stethoscope to monitor cellular acoustics in vivo. The research was supported in party by a grant from the National Science Foundation (grant ECCS 11-50952).